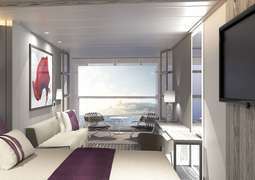 The Celebrity Apex is the second ship in the Celebrity Edge Class. Coming in April 2020, it will be cruising the beautiful Mediterranean and the sun-soaked Caribbean waters. The ship's design is totally innovative in a way that 99% of its spaces are facing outward, bringing the stunning views inside and giving you access to the open sea. The Celebrity Apex will revolutionize the way you discover the world. 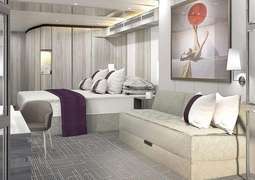 Full of unique features, like the industry-first 'Magic Carpet', a space that changes its purpose depending on location, the Celebrity Apex is transforming the cruise industry. 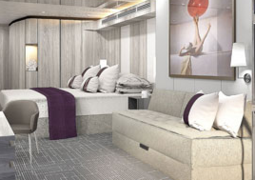 There is plenty of unparalleled luxury that Celebrity Cruises is known for - the 'Retreat', the 'Rooftop Garden' and the 'Eden' are just some of the exquisite spaces on board. All the cabins are equally stunning and elegantly designed, meaning that even if you go for the value-for-money Inside Cabin, you will still feel pampered and spoilt. Everything about the Celebrity Apex is reimagined, its cabins aren't an exception. 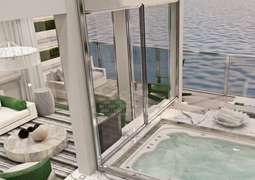 All of the cabins are designed to bring the outside in and to give you open air access to the sea. The range of cabin categories is wider than ever: from single staterooms to the value-for-money Inside Cabins and the indulgently panoramic Outside Cabins, the choice is yours. For something a little more special go with a Balcony Cabin equipped with an Infinite Veranda, an iconic Royal Suite that sleeps up to ten guests or one of the luxurious Villas. No matter which category you choose, you will be surrounded by beautiful interior, designed by Kelly Hoppen. There are 29 unique food and beverage experiences on board the Celebrity Apex - you will be spoilt for choice. All of the venues will prepare Michelin-star level food that focuses on the destinations being visited. All the flavours of the world are brought together under one roof - you will not be disappointed. The Celebrity Apex has an extensive range of inclusive dining - 4 very different restaurants will be serving new American, contemporary French, fresh Mediterranean and Italian cuisine. Guests booking Suites will enjoy two additional exclusive restaurants: 'Luminae at the Retreat' and 'Blu'. Your appetite for adventure will definitely be satisfied on board the Celebrity Apex. The Celebrity Apex is here to make your cruise holiday even more destination immersive than ever before, starting right on board. Experience the cruise industry first - 'Magic Carpet'. This function- and location-changing venue will provide you with the most spectacular views and exciting entertainment. Entertainment is a priority on the Celebrity Apex: unforgettable award-winning productions and exclusive brand-partnerships will be engaging you throughout your sailing. Relax and unwind at the 'Eden' - the 'room that lives' with al fresco seating, panoramic ocean views and ever so present nature.